Sonia Delaunay, Tamara de Lempicka, Barbara Hepworth and Zaha Hadid - just some of the pioneering female artists that are an enduring source of inspiration for Karen’s distinctive hat designs. Bold sweeping lines, sensitive use of materials and colour, and a sculptural approach to design are all key principles of Karen’s elegant designer hats. Read on to find out more about each artist. 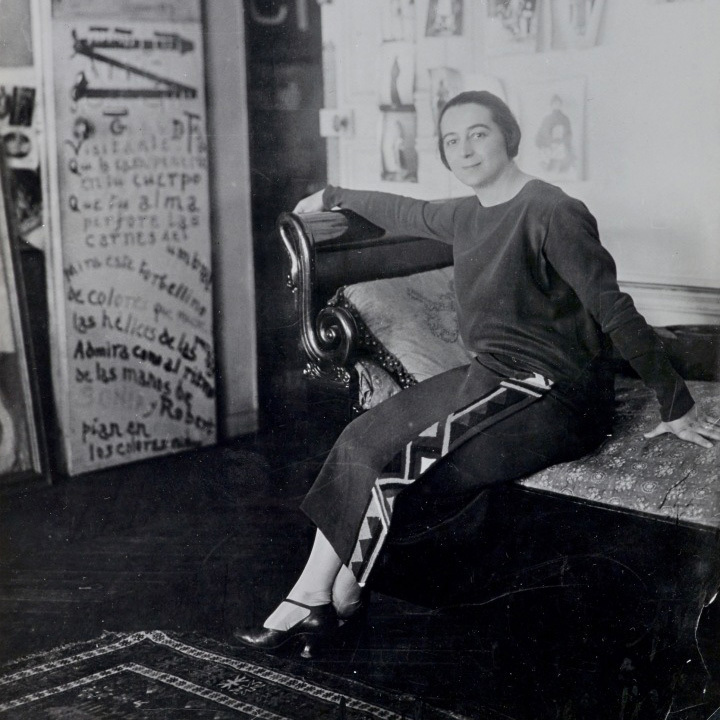 Russian-born key figure of Paris avant-garde and abstract artist. Along with husband Robert Delaunay she was at the heart of the Simultanism movement. In her work fine art and craft were on an equal standing. Polish-born painter who worked in Paris and the United States. Her work was mainly figurative, blending cubism and the neoclassical style, with a particular focus on female portraits. Leading British sculptor whose work evolved from being naturalistic with simplified features, to being entirely abstract in the 1930’s. Her incredible career spanned five decades. British architect born in Iraq. Her innovative buildings are gravity-defying and give visitors a sense of instability and movement, a style known as Deconstructivist architecture. Different eras, different media - Fine art, textile design, costume design and architecture - what’s the connection? Delaunay’s embrace of the Simultanism principles led to the use of contrasting and complementary colours in her abstract painting. In Prismes Electriques, her blended use of colour makes for a vibrant, dynamic composition. 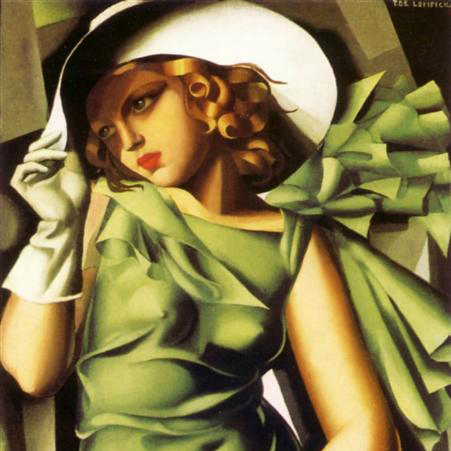 One of the best known artists in the Art Deco style, Tamara De Lempicka’s work depicts sensual women. Inspired by cubism and cropped in a similar style to photography. Faces, bodies and panes of fabric come alive with Lempicka’s structured use of colour. Hadid’s elegant architecture is daring and uncompromising. The London Aquatic Centre’s design could not be more sculptural, it was a star of the 2012 Olympics. Its fluid roof seemgly floats above walls of glass on either side. Zaha Hadid described the intention for the design as “a space that feels more like a liquid”. The building is a harmonious statement that blends into its setting and is both beautiful and useful. Barbara Hepworth’s understated and strong abstract designs are iconic in their simplicity. Her immaculate surfaces and panes meet at intriguing angles with sharp and well defined connections. Barbara Hepworth’s sensual sculptures in marble, stone, wood and metal invite the viewer to look more closely, to be invited in the spaces in between - in order to get a more intimate sense of their volume. Playfully switching between media and working alongside husband Robert, Sonia Delaunay was an artist in her own right. Giving equal weight to craft, design and fine art, her practice encompassed needlework, patchwork, textile design as well as painting. This approach gives Sonia Delaunay’s work vitality and freshness: a patchwork, inspired by an abstract painting, would in turn inspire a textile design or a new painting. Equally versatile in her design practice, Zaha Hadid gained international recognition in a male dominated industry. In 2004 she became the first woman to be awarded the Pritzker Architecture Prize. Karen named a women’s hat collection after Sonia Delaunay, here are a few design details. See the women’s collection here, or the women’s couture collection here. Explore Karen’s distinctive designer hats for men and women in the shop.